New Wall Street Journal Deals – “Knowledge is Power, information is liberating” – Kofi Annon. Well said, Kofi, and I’ll add that it’s also empowering when you get a great deal on a WSJ subscription which is full of empowering knowledge. 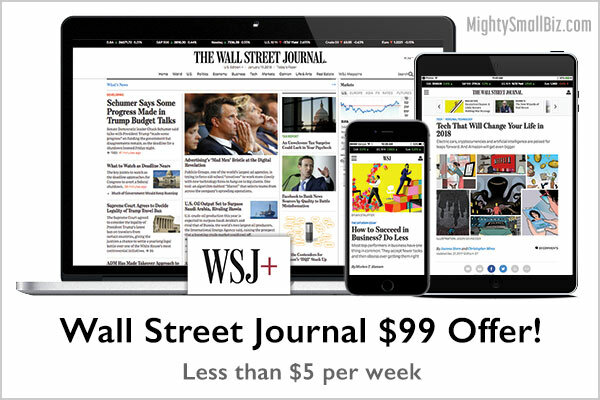 Check below for the popular Wall Street Journal $99 offer, or use a coupon for up to a 50% discount on a 6-month print and/or digital (aka “All Access Digital”) subscription. No promo codes are needed, so just click to apply a coupon! What’s the Best Subscription Deal? The Wall Street Journal offers at least two different subscriptions deals each week, but which one is best? Short-term promotions like, “$12 for 12 weeks,” are tempting because they cost less initially, but are they really the best deal? Most of the time the answer is, “no,” and you’ll get a better price with other promotions, like the $99 offer for All Access Digital. Let’s Compare WSJ (All Access Digital) Deals to see which one is best for you. Looking for a print subscription? No problem, it’s really inexpensive to add print delivery, so we’ll discuss that, too! 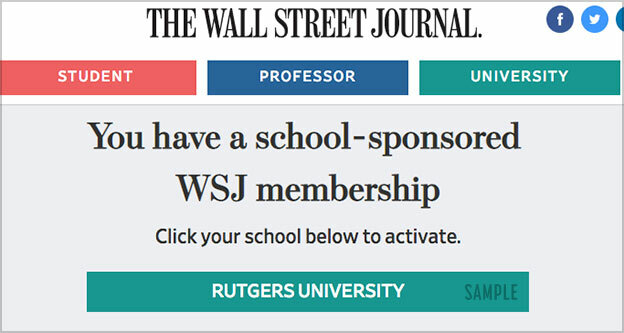 The most popular promotion for WSJ is their $99 offer for All Access Digital, also promoted as a 50% off coupon. This isn’t surprising because readers of the Wall Street Journal are shrewd and know a good deal when they see one. Also, most readers prefer the online version, as financial news is updated by the minute, and it includes all video content. In fact, the $99 offer saves you over $250 on the first year of your WSJ Digital subscription. 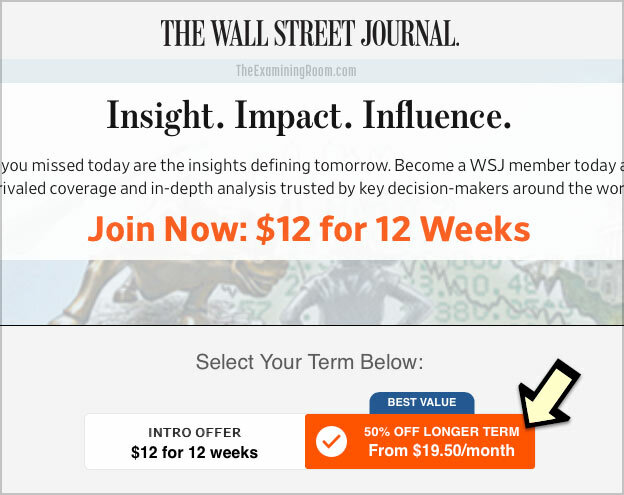 Before looking at the details of this coupon on wsj.com, let’s also consider another popular coupon, the “12 weeks for $12” promotion. 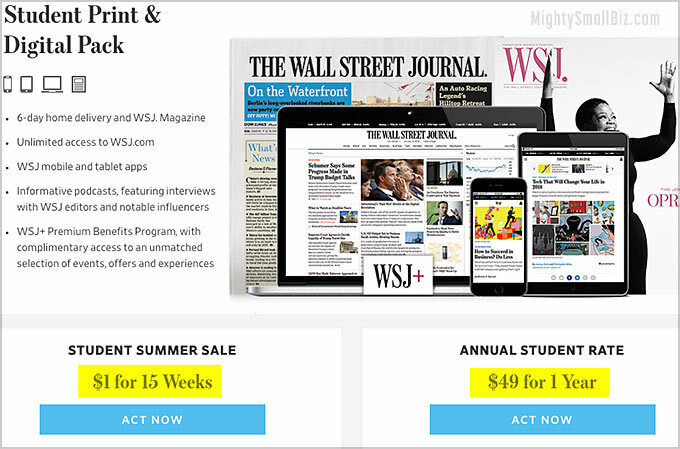 Wow, $1 per week for a WSJ Subscription?! Yes, it’s an attractive deal, but only short term. I would recommend these coupons for shorter subscription durations only if you are undecided as to whether to continue your subscription long-term. Let’s look at hard numbers to decide which of these offers is best for your needs. The two most popular promotions are of different durations, so let’s compare apples to apples and see what they cost over 6 months and one year. The difference between these promotions isn’t a big deal for the first 6 months, but over the course of a year it’s really significant, as the “50% off” deal saves you an extra $129 over 12 months! It can also save you even more compared with the higher 6+ month cost with their “$1 for 2 months” offer here, and WSJ on Amazon. If you are just dipping your toe into reading The Journal, then $12 for 12 weeks is a good way to do so. There’s no commitment after the initial 3 month promotion, and you can cancel anytime before that time lapses. However, if you plan to subscribe for 6 months or more, then the “50% off” deal is much better, as it locks in the lower subscription rate for up to 12 months, instead of 3 months. What About the Wall Street Journal $99 Offer? 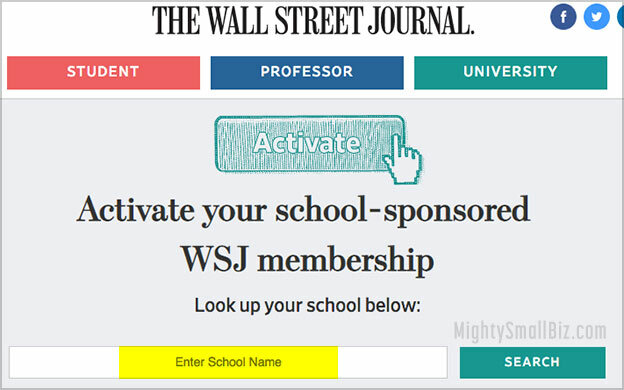 The best possible deal is their $99 WSJ Digital for 6 months promotion which saves you an extra $17 over 6 months compared to the 50% off coupon. While this deal isn’t available most of the time, it is advertised seasonally including Black Friday and before the significant holidays like Christmas and July 4th. Is the $99 promotion available now? You can check by viewing their best available promotion here. If you aren’t in a rush to subscribe, you can wait for the $99 offer to become available once again. Coupon for a Print Subscription? I’m glad that you asked about WSJ print, because I still love the feel of holding a newspaper in my hands, especially on the weekend when I try to unplug and be more present, and less concerned about what the market is doing minute by minute. Anyway, if you want a print-only subscription, it costs about the same as a digital subscription. The real savings comes when you bundle print and digital together, as adding print delivery only costs an extra $3 per month! The savings with the “50% off” deal for a print subscription are similar to the numbers above, and you can see today’s exact prices here. (Sample amazing WSJ video content above) Founded in 1889, the WSJ is the world’s leading business publication, read by more business leaders than any other media. WSJ.com is a 24/7 365 day a year guide to the top business news world-wide, giving you access to news as soon as it breaks. A subscription to the Wall Street Journal print (paper delivery) edition puts the day’s top stories in your hands every morning, offering the best reporting and business news in print; the reason why The Wall Street Journal has earned the appellation of being the #1 business publication worldwide. This entry was posted in coupons and tagged coupon, subscription, wall street journal, wsj on November 9, 2018 by kevin.